In the near future, the Supreme Court of Ukraine is to put an end to a lasting dispute between two pharmaceutical companies, Farmak and Darnitsa, for the right to use the name “Corvalol” in the manufacture of their medicines. Farmak appeals to history and refers to the following facts. 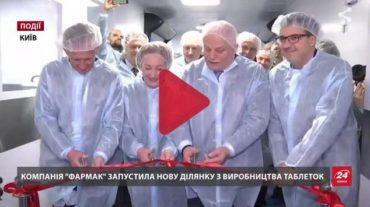 The first batch of “Corvalol” was released at Lomonosov Kyiv Chemical and Pharmaceutical Plant (since 1991 – Farmak) in 1960. The drug name was invented here as well. In 1993, the company defended the “Corvalol” trademark with the Department of Intellectual Property of the Ministry of Education and Science of Ukraine, and in 2004 the designation “Corvalol” was recognized as well-known. In 2017, the decision was once again confirmed by the Appeals Chamber of the Ministry of Economic Development. The verdict of the Appeals Chamber was challenged by lawyers of Pharmaceutical Firm “Darnitsa”. Since 2005, Darnitsa has been marketing its own drug with a similar name, “Corvalol-Darnitsa”, and is trying to abjudge the exclusive right to use this name from Farmak. Shortly before the next hearing, weird things happen around Farmak JSC. 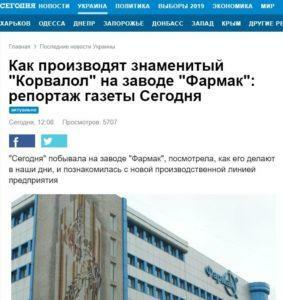 Dozens of negative publications about the company’s activities (all with the same content) appeared on the Internet; Farmak’s partners were searched; a petition for nationalization of the company was registered on the website of the President of Ukraine; some thugs blasted smoke grenades and yelled accusations under the walls of Farmak JSC’s office. Filya Zhebrovska, ultimate beneficiary of Farmak JSC, its long-standing General Director and now – Chairman of the Supervisory Board, refers to the recent events as an attempt to exert pressure on the company before the important hearing. For this and other materials, please see her interview below. How could you comment on the recent events around your company? This is not the first time that Farmak and I personally were put under pressure. I recall 2003. Then I was subjected to searches, inspections, all sorts of things like that. I stood my ground. 2009 came. I was shot in the back. When I already was the leader, 2011-2012s began. They nearly called me drug lord for marketing some drugs. There were thugs and stuff. All branches of power, law enforcement agencies were involved. Still, I kept standing. What happens today? Some petition for Farmak’s nationalization is registered on the President’s website; some inquiries not related with pharmaceutics come from the Security Service; our suppliers are being searched; bullies arrange protests near the office. What for? These may be provocations to distract me from the sensitive topic: the hearing in the Supreme Court with respect to “Corvalol”. Actually, there are specific accusations that you continue to cooperate with Russia. What can you say in this regard? Back in 2010, we developed a strategy, whereby 40% of all revenues should come from exports. We launched two offices: bought a company in Poland and opened a representative office in Russia. According to official statistics, the largest part of Ukraine’s exports now is to Russia – more than USD 2 billion in the first 7 months of the current year. The largest part of imports is from there as well. Our company’s share in all-Ukrainian sales in Russia is only 0.3%. But for some reason we are the only entity that is subject of a petition on the President’s website. First, we must answer ourselves, both the authorities, and the society. Are we going to make the curtain? Let’s do it. I will comply with any decisions applied in the state. But it is only now, after five years of war, that the government says that from tomorrow it will suspend the Treaty of Friendship with Russia. So what did our company and those 3,000 people, who come to work and want to work freely instead of waiting for some smoke grenade being blown over their heads, violate? Indeed, actually, why do questions to you arise only now, after five years of war? I have never denied that we continue working with Russia, although we do not register any new drugs there. We can, but we don’t. We do not expand our portfolio. Yet, we supply already registered products there, until there is some decision in the highest echelons of power to ban exports to Russia. Why are we being accused now is actually an interesting question. Probably, because soon there will be a hearing to defend the “Corvalol” brand, so, perhaps, someone needs to stir up the hype, create some negative attitude towards our company. I should note that I am honest with the Ukrainian people, my team, and the state. There is no prohibition, no restrictions. Putting stress on the moral side of the issue? Opponents consider it acceptable. But the money I earn will be spent here, in Ukraine. I did not divest it to offshores. 4-5% of each earned hryvnia is spent for dividends to shareholders. Everything else – for development of the company, payment of taxes and wages. My team and I never forget about our defenders. For 4 years already, the entire staff works one day for the army. This is help. In 2014, it was used to buy clothing and food; now – to repair equipment, deliver optical devices and much more. This is also help to families of the deceased fighters as part of the “People help people” program. Who is behind this pressure on the company? I would say that today the older generation is retiring already. These are people who had values in their souls and could not neglect them. Now, the new generation has come. They have higher education, often foreign one. These are people with rally good training. But they have no core of responsibility. I should note that we are not the only ones that have such problems. 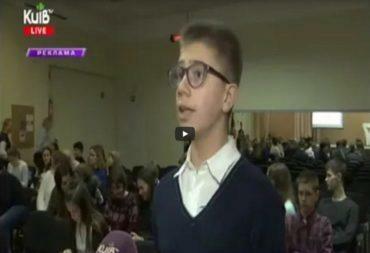 The situation is the same in Odesa, in Borshchagovka, in Kharkiv. I was very unlucky to be subjected to such attacks over the past 13 years. Perhaps, the initiator is the same in all cases. The conflict around “Corvalol” has lasted for more than 10 years. Why is it so important for you to defend the exclusive right to this brand? To understand the whole picture, you need to take a quick glance at the background. Farmak JSC has in its portfolio several products, on which the entire philosophy of creating the Lomonosov Kyiv Chemical and Pharmaceutical Plant (now Farmak) is based. These are “Diazolin”, “Corvalol”, “Naphthyzinum”, and “Validol”. These are medicines that first the plant and then Farmak manufactured end-to-end: from synthesis of the substance to release of finished dosage forms. These drugs are our history and philosophy. We kept them, we protected the intellectual right for them back in 1993. Because they are like heirlooms. I have a cup that my father gave me when he was 60 years old. Two years ago, we celebrated an anniversary: 100 years since he was born. Naturally, I relish this cup. This is our family’s heirloom. My attitude to “Corvalol” is the same. Recently, there was information in the media that your company and Darnitsa have almost equal shares of “Corvalol” market: UAH 44 and 43 million in annual sales, respectively. However, Darnitsa itself reports that its annual turnover is several billion hryvnias. Why is Darnitsa trying so hard to abjudge the right to use the name “Corvalol”, if it accounts only for minor amounts in its profits? This is the new generation with its ambitions. A competitor comes and pushes his claims, insisting on things the way he wants it. But this is not how things happen in real life. It takes a trial and a legal assessment. As I understand, you are not going to give up? “Corvalol” is like that heirloom cup; it is a tradition that must remain in the company and not become a bargaining chip in the market. For me, it is a relic, and for opponents – their ambitions.